I noticed that I have three nomination posts to acknowledge and pass on. So, decided to do that today. First, I’d like to thank Lori from Creating Beauty in the Kitchen for nominating me for a Liebster award. Delighted to accept the nomination. If you have not visited Lori’s blog yet, please do so as her delightful healthy recipes and craft work will be sure to enchant you. What did you want to be when you grew up? Ambassador (Career diplomat) – this was my career plan from the age of five until I completed my first degree. What has been your favorite age so far, and why? The present. I try to live in the moment. Would you rather watch a movie or read a book? A book. Would you rather be inside or outside? I am very much an indoors person, except when I travel out of my city. If you could use one word to describe your home, what would it be? Mother. What is your favorite type of music? Carnatic music. Where is the farthest you have ever traveled? Hawai’i. Why do you like cooking? I like it when the people I care about enjoy the food I make for them. I am combining my nominations for passing on this Liebster award with my nominations for the next award from Adorable Life blog. Thank you, Nimmi, for nominating me as part of your WordPress Family. Honoured and delighted to accept this special nomination. Within five months of starting her blog, Nimmi has shared many tasty recipes that she has been trying out. Do visit her blog, if you have not done so already. Finally, thank you once again Nimmi, for nominating me for another blog award – this time, the Inspiring blogger award. Appreciate it much. I’d like to nominate the following fifteen bloggers, for the Inspiring blogger award, whose posts I enjoyed very much during the past week. Bourbon and Brown Sugar (MB)’s post on cinnamon chocolate cup cakes (shared at Fiesta Friday #30). Cafe Garima’s post on Mughlai Gobi. Creating Beauty in the Kitchen (Lori)’s post on vanilla cherry chocolate chip muffins (shared at Fiesta Friday #30). Deena Kakaya’s post on her spicy potato and sweet corn soup. Foodie on Board (Chef Julianna)’s post on grapefruit salad Saigon style (shared at Fiesta Friday #30). La Petite Paniere (Linda)’s post on potato omelette. Mademoiselle Gourmande (Tina)’s post on party dips. Our Swedish-American Pantry (Malin)’s post on lingonberries including her family’s recipe for lingonberry jam. Simply Vegetarian (Sonal)’s post on potato and gouda cheese balls. Spice in the City (Naina)’s post on her easy apple crisp recipe (shared at Fiesta Friday #30). The Brook Cook (Josette)’s post on herbed ricotta pasta with corn and zucchini (shared at Fiesta Friday #30). The Novice Gardener (Angie)’s post on Mille Crepe Cake together with the FF#29 entries. The Odd Pantry (Aneela)’s post on BT cotton farming. Vedged Out (Somer McCowan)’s post on Vegan Pani Po’ Po (shared at the Virtual Vegan Linky Potluck #8). Congratulations to all the lovely bloggers and in lieu of questions, I’d appreciate it if you do share a favourite memory of yours, be it travel, music, movie or books. To wrap up this nomination acceptance and passing it on post, I would like to share a lovely music clip. I have had this CD for over a decade now and had purchased it because it had one of my favourite musicians, tabla maestro Zakir Hussain, and one of my father’s favourites, South Indian violin maestro Kunnakudi Vaidyanathan collaborating together. Until recently, I did not know that A.R.Rahman was the keyboard player in this album and this was very early on in his music career. As this is A.R.Rahman music month on this blog, I am sharing this lovely clip from the Golden Krithis Colours album (1992). Thank you, Linda, for nominating me for the readership award. I have always enjoyed your blog and am delighted to be nominated by you once again. 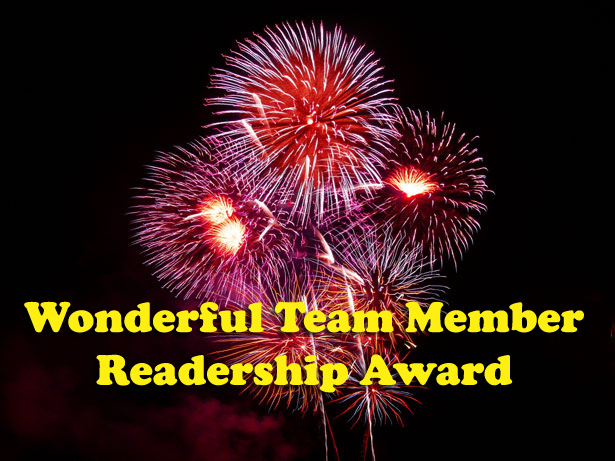 This award is meant to be passed on to 14 blogs whom one has enjoyed reading during a particular week. As such, I would like to nominate the following lovely bloggers with their posts that I enjoyed during the last week. Next, I would like to thank Nimmi for nominating me for the Versatile Blogger award. I am honoured to accept it and am happy to have come across your lovely blog through Angie’s Fiesta Friday event. I understand that part of the nomination acceptance includes sharing 7 things about oneself and nominating 15 other bloggers. I decided the thing I would share today would be books so here are the names of 7 of my all-time favourite books, in reverse alphabetical order. I would like to nominate the following wonderful bloggers for the Versatile Blogger award. To wrap up this post, I would like to share this beautiful debut song of Harini, from the movie Indira (1995), with music composed by A.R.Rahman and lyrics written by Vairamuthu. Trained in Carnatic music from a young age, Harini was noticed by A.R.Rahman in a school contest and was introduced to the movie playback singing world through Suhasini Maniratnam’s movie ‘Indira’. Thank you for the blog awards! Thank you, Sanjana. 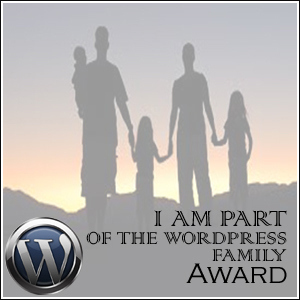 I am honoured to be considered part of your WordPress blog family. Thank you for sending me feedback on my food posts regularly. I enjoy your posts as well and hope to try out a couple of the Fijian food on your blog sometime. For now, I would like to nominate the following lovely bloggers for this special award. Next, I would like to thank Charanya of Yes! I’m Vegan and Malar of Malar’s Kitchen for nominating me for the Liebster blog award. I enjoy checking out the vegan recipe posts of Charanya and the kitchen experiment posts of Malar. What’s your favorite cuisine? My mother’s home-cooking. Do you watch Game of Thrones? No. If you are vegan, why? If not, do you think you could be one for few days? I am not vegan but the food in my home leans mostly towards vegan. Is there anything your life wont be the same without? my mother. What’s your favorite movie? Salangai Oli (1983). Is there any color you loved as a kid? Blue. I still love the colour. Is there anything you would change in your life if life had a rewind button? I would go back to those moments when I have judged situations viewed through very rigid lens and respond differently. Do you own an iphone or an android? An android. 3 words that could describe you: Life long learner. Weekends what do you do? Mostly read. Who is your favorite Actor/Actress ? I generally have favourite movies rather than favourite actors but after considering the fact that Kamal Haasan seems to have acted in most of the Tamil movies that I have really enjoyed, I guess my favourite actor is Kamal Haasan. I do consider him South Asia’s best actor. Something which you love to do other than cooking: Travelling. Instead of the questions, I only have one request to those accepting the above nominations. Please do share one of your favourite music clips on your acceptance/ nomination post. To wrap up this post, I’d like to share a colourful folksy song from the movie Azhagiya Tamil Magan (2007) starring Vijay Chandrasekhar and Shriya Saran. Credits: music composed by A.R.Rahman, playback singers are Benny Dayal, Archith and Dharshana. Thank you to all the readers of this blog! Have a lovely week! Thank you, AJ @ AJ’s Dessert Course, for the nomination. Having bookmarked several of the delectable recipes that AJ has posted on her site, I am honoured to accept the nomination. With regard to the seven random things to share as part of the acceptance of the nomination, I decided to share something about my mother this time as she is the main contributor of the recipes on this blog and is a very inspiring person. My mother has a warm, kind and energetic personality that tends to make people gravitate towards her. She also enjoys organizing activities and events and is wonderful at bringing together people, no matter how at odds they are with each other. Her favourite poet is Mahakavi Bharathiyar, a pioneer of modern Tamil poetry. She is a wonderful short story writer in Tamil and of course, I am biased. My mother’s favourite comfort food is fresh bread and steamed vegetables. My mother is obsessive about her morning and evening walks. I think it was her personal time to collect her thoughts and de-stress away from us when we were children and now, it is mainly for health reasons. I do admire and enjoy each of the blogs that I follow and look forward to discovering new ones. 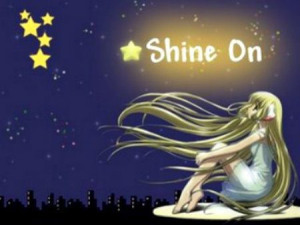 In the meantime, I nominate the following seven inspiring blogs from the lovely blogs that I follow, for the Shine on award and hope they choose to pass it on. Fig & Quince – I love the Persian cuisine and culture posts of Team Azita, Fari & Felfeli on their delightful blog and am enjoying trying out the veganized version of the stews and soups posted on the blog. Iceland in the company of heroes – I love the travel stories and photos of Iceland posted on this blog, as described by the Edinburgh university graduate who hitchhiked around Iceland exploring the places described in Njals saga. La petite paniere – Linda’s delightful food blog with many recipes that I have bookmarked to try out. Poppy’s Patisserie – One of my favourite baking blogs and whose recipes I have tried out several times. This is thirty – I admire Laura’s commitment to her passion for running and enjoy her thoughtful posts, plus her gluten-free, vegan recipes. Travel Cathay – Given that I have a special interest in the theme, particularly Yunnan, I love this blog that focuses on ancient and ethnic villages of China. Yallah, bye – I particularly like the sketches and accompanying short narratives of his travels that Nicholas Andriani posts on his blog. I had a post pending so I thought I would go ahead and post it before the New Year dawned. Congratulations and Thank you, Susan, for nominating my blog for the quaint Dragon’s Loyalty Award. As a subscriber of Susan’s lovely blog, I am happy to accept the nomination. I would also like to congratulate Radhika @ SugarnSpice blog for her first award within a week of starting her lovely food blog. Thank you, Radhika, for nominating me for the Liebster award! I understand that part of accepting the Dragon’s Loyalty Award nomination means that I share seven things about me and nominate up to fifteen blogs. The Weligama bay area, on the southern coast, is one of my favourite spots in Sri Lanka. I once raised a baby squirrel, that had fallen into our home, when I was a kid. I named the squirrel Rikki, short for Rikki-Tikki-Tavi. The first play that I saw was at the age of 6 and it was the performance of Shakespeare’s “The Tempest” at the British Council in Jakarta. Since then, I have been a fan of the theatre. I am fond of instant soup noodles – Indomie was my favourite as a child and now, I tolerate other brands such as Maggie and Ramen. I generally find shopping tiresome and prefer shopping only when there is an absolute necessity and with specific lists in my hand. I used to have a habit of collecting books and while I am trying to get rid of that habit, I still enjoy libraries and bookstores. I would like to nominate the following lovely blogs for the two awards and of course, taking it forward is optional. May the new year bring you peace and contentment! Happy New Year! Thank you, Diana, for including me in your WordPress blog family! I am touched by your nomination and am honoured to accept it. I followed the link included in Diana’s post to the post by the creator of the award, Shaun Gibson, and very much like the concept of the award – the WordPress family. While my blogging experience on WordPress is relatively new, compared to my blogging experience on other blogging platforms, I certainly feel that the WordPress blogging community is warmer, friendly and encouraging. Therefore, I would like to thank all the readers of this blog for stopping by to browse through the recipes. Thank you especially for the feedback you leave behind – your ‘likes’ , comments and emails. I do enjoy these interactions and I hope you enjoy the recipes you try from this blog! In keeping with the spirit of this award, I would like to nominate some of the blogs I subscribe to and enjoy reading for both the content and the way the lovely personalities of the bloggers behind these blogs shine through. I will be taking a blogging break for the rest of the month except for perhaps a Christmas guest post and a couple of long-pending posts on my other WordPress blog – Tales from Sri Lanka. So, I wish you a Merry Christmas (all those who celebrate or enjoy the spirit of Christmas) and Happy holidays (everyone else)! See you in the New Year! A few days back, I was surprised by a touching email from a fellow blogger. Surprising because I found that my blog had been nominated for an award and it has been in existence for only four months. Thank you, Diana @ Little Bits of Nice for nominating my blog for the Liebster Blog Award! After the nomination email brought a smile to my morning, my penchant for history had me looking for the roots of this award. Tracking back through the links till it broke off at some point within this year and after ‘googling’ around, I made some interpretations of the various information that I came across: (1) the award is a lovely chain award passing on the spirit of sharing, (2) the nomination is not necessarily meant for new bloggers as much as it is meant for favourite or special blogs, (3) the nominated blog’s theme can be any subject as it rather depends on what the favourite topics of the nominator are, (4) there has been a range set to the limit of readers to a nominated blog over the years and it seems to vary between 100 in 2013 and 3000 back in 2010. Further, there are variances to accepting a nomination, in that it is quite flexible. As such, I prefer to accept Diana’s kind nomination of my blog in the following way: sharing a few facts about my blog, 10 questions answered, 10 new nominations and 6 new questions for the nominees. This blog is the sixth of my seven blogs and is the only one focused on cuisine. While I have initiated this blog and am keen to put together a site that will eventually have a representative sample of Sri Lanka’s multi-ethnic cuisine, I have personally not contributed any recipe yet. My role has been to reach out to friends and invite them to send in recipes and as regular readers may already know, I also record and transcribe my mother’s recipes and photograph the food she makes. Before this year, while I did engage in occasional cooking, I used to keep out of the kitchen most of the time and sticking to basics when I had to cook. It was during the last six months of trying to cook something different, colourful and nutritious enough to tempt my mother to eat when her health declined, that my interest in cooking came about and I have found that I enjoy baking. This blog has become something more than just a documentation of Sri Lankan recipes to me. I have found that it has re-sparked my mother’s creative interests and she enjoys sharing her recipes and stories a lot. Despite her current frail health, she seems to enjoy concocting creative, new food. 1) What herb could you not do without? Turmeric. I am fond of a number of herbs but I think turmeric is an absolute essential in my kitchen. Not just for cooking, but also as an antiseptic. 2) What is your favourite season? Autumn. I love the fall colours. Even more so because I have had few occasions to experience it. 3) City or Countryside? City. I like to live in a city that is close to the sea but I love to travel out to the countryside on holiday as it always rejuvenates me. 4) What is your happiest memory? My years in Sweden. I guess it is because I felt a good sense of independence, freedom of thought, expression and movement in addition to the beautiful environment and wonderful friends. 5) What is the thing you most love to do? Explore through travelling or creative writing or usually both. 6) Are you an early riser or a night owl? I usually wake up before dawn as that is my most productive thinking time. 7) What is your favourite item of clothing? Shawl. I love shawls and usually buy locally designed shawls when I visit a new country. 8) Sweet or Savoury? I have a sweet tooth! 10) Following on question 9, which of them is your favourite and why? Hawai’i. There is a wonderful healing vibe around Hawai’i, particularly Big Island, and I lived there at a time when I needed some time to reflect on my next steps. So, besides the beautiful blue skies and seas and the amazing double rainbows of Hawai’i, it is special because of the particular moment that I visited the breathtaking islands. Now, for my nominations… Based on my interpretations of the award, I have chosen ten blogs from those that I now enjoy following and my selection has also included travel blogs, journals/ memoirs in addition to culinary blogs. Your blogs are truly special, in that you share what you care about a lot with the world, and it comes through your writing, recipes and photographs. Keep on continuing your wonderful work! And, I hope you accept my nomination. Who is your favourite fictional character and why? Which place in this world makes you feel most at home and why? If you were to cook a meal for the most favourite person in your life, what would be the meal you cook? If given the choice, which wildlife would you contribute towards protecting and why? What do you consider as the biggest priority in environmental protection and conservation? Apart from the places you have already travelled to, where would be your next dream destination and why? My warmest wishes to all of you, the readers of this blog… Have a lovely week!